Republicans don’t want to find out what happened with Russia. That’s why they spent the Comey hearing defending Trump and Michael Flynn—and attacking the FBI. FBI Director James Comey testifies before the House Intelligence Committee on Monday on Capitol Hill. 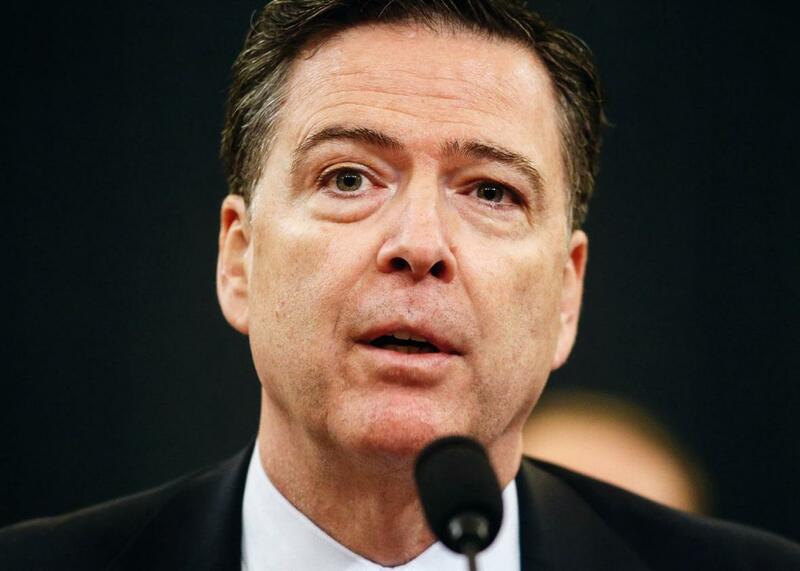 On Monday, the House Intelligence Committee interrogated FBI Director James Comey and National Security Agency Director Mike Rogers about Russia’s covert operation to manipulate the 2016 presidential election. Comey confirmed that the FBI was investigating, among other things, whether anyone associated with Donald Trump had coordinated with the Russians. The committee is supposed to be conducting its own Russia probe. But Monday’s hearing showed that the Republicans who run the committee can’t be trusted. 1. There’s nothing to investigate. A real investigation would examine particular claims and evidence. Instead, Republicans on the committee tried to foreclose the whole inquiry by quoting broad statements (made by former intelligence officials on talk shows and the salon circuit) that no evidence exists. They also cynically stripped the statements of important caveats. When Comey and Rogers said they couldn’t rebut these statements about a lack of evidence (since to do so would reveal classified or investigation-related information), Republicans portrayed that as confirmation of Trump’s innocence. This is an attempt to end the investigation before it begins. 3. Russia didn’t fabricate votes. To shift attention away from Russia’s indirect manipulation of votes—for example, leaking private emails that embarrassed Hillary Clinton and persuaded people to vote against her—Nunes emphasized that Russia hadn’t tampered directly with voting machines. Rogers noted that the NSA and FBI hadn’t assessed the political effects of Russia’s operation. Nunes ignored him and shaped his questions to portray the Russian campaign as impotent. 4. Russia’s motives are unknowable. Comey and Rogers tried to explain, based on information in the public record (for example, selective leaks of Democratic rather than Republican material), how they knew Russia had sought to help Trump. The Republicans refused to accept that conclusion. They repeatedly suggested that Rogers didn’t really believe it, despite his assurances that he did. Some Republicans said the discernment of motives was impossible. “To determine motive, you’ve got to crawl inside someone’s head,” said Rep. Chris Stewart. 5. She asked for it. Trump has often said that the Democratic National Committee invited Russia’s attack by failing to protect its servers. He has also cast doubt on the DNC’s victimization on the grounds that it rejected the FBI’s request to examine the servers. At the hearing, Republicans suggested the DNC was negligent on both counts. Comey explained that the DNC had enlisted a private firm to do the requisite forensic examination and that the FBI considered this sufficient. The Republicans ignored him. 6. Look over there! Nunes prodded Comey to investigate whether anyone associated with the Clinton campaign or the Clinton Foundation had contacts with Russian agents. Meanwhile, Rep. Peter King suggested that President Obama’s attempts at reconciliation with Russia were as suspicious as anything Trump had done. Neither allegation was serious. Their only purpose was to disperse scrutiny. 7. Flynn’s guilt hasn’t been proved. Flynn stepped down as Trump’s national security adviser last month. But at the hearing, Republicans insisted he had done nothing wrong. Rep. Michael Turner asked incredulously whether going to a conference in a foreign country and sitting with that country’s leader, in exchange for payments that didn’t come directly from that country’s government—an obvious reference to Flynn’s 2015 trip to Russia—really merited investigation. Turner added that Flynn, in his secret December phone call with Russia’s ambassador, hadn’t explicitly promised to reverse sanctions on that country. These are the lamest of lawyerly distinctions. 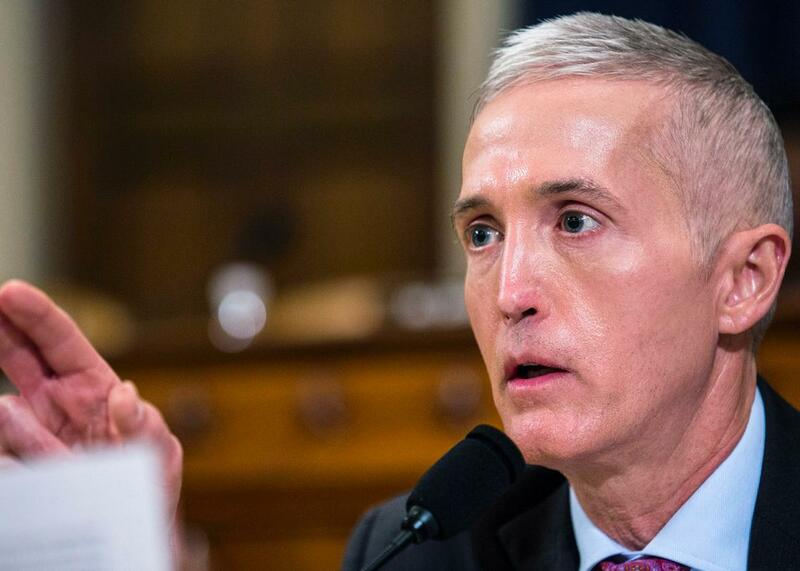 Rep. Trey Gowdy speaks at the House Intelligence Committee hearing on Monday. 8. Flynn’s violations of law aren’t important. Under the Logan Act, an old law, it’s illegal for a private citizen to conduct diplomacy, as Flynn did in his December phone call. Three weeks ago, Nunes called the Logan Act and its application to Flynn “ridiculous.” At Monday’s hearing, Rep. Trey Gowdy made the same point, noting that no one had ever been prosecuted under the Logan Act. Meanwhile, Gowdy and other Republicans suggested that reporters should be prosecuted for publishing leaks. Laws are for other people. 9. The real villains are the leakers. Republicans borrowed a favorite tactic of criminal defense lawyers: They put the police on trial. They said the investigation should focus not on who colluded with Russia, but on who might have given information to the press about such collusion. Pointing to specific articles, lawmakers demanded to know which four officials had spoken to this newspaper and which nine had spoke to that one. They pressed Comey and Rogers to compile lists of suspects. They named possible culprits, including Sally Yates, the then–acting attorney general who had told the White House about Flynn’s deceptions. In the GOP’s moral universe, Flynn is a victim, and Yates is a suspect. 10. If you don’t find the leakers, you’ll lose your surveillance programs. Several times, Gowdy and other lawmakers warned Comey and Rogers that if the leakers weren’t caught, the public might get angry and rise up against surveillance programs, blocking their reauthorization. Meanwhile, the same lawmakers used the hearing to stir up anger over the leaks. This isn’t genuine outrage. It’s blackmail. 11. The intelligence agencies changed their story. Nunes depicted a suspiciously shifting account of Russia’s motives. He claimed that at the beginning of December, the agencies’ assessment “was not that [the Russians] were trying to help Donald Trump. But that changed by early January.” Comey corrected Nunes: “We didn’t change our view.” Comey is right: On this and other points, the intelligence community’s draft assessment, summarized by the Washington Post on Dec. 9, matches the final version released on Jan. 6. Nunes repeated his claim—“by January, you had all changed your mind”—and launched into a complaint about aspersions against Republicans, which Comey and Rogers also denied. Nunes seemed more interested in defending his party and undermining the agencies’ credibility than in listening to the witnesses. That’s a direct attack on the integrity of the former president and the intelligence agencies. Not one Republican rose to either’s defense. 13. Maybe Obama was the Flynn leaker. Gowdy asked Comey: “Did you brief President Obama on any calls involving Michael Flynn?” Later, Turner asked Comey whether then–Director of National Intelligence James Clapper had briefed Obama and whether Obama had confided to Comey about being briefed by anyone on Flynn. The Republicans never spelled out why they kept asking these questions. But the intended effect was to cast suspicion on Obama. 14. The wiretap charge against Obama might be true, in a way. Since March 4, when Trump falsely accused Obama of tapping his phones, Nunes has argued that Trump’s charge should be reinterpreted in its most plausible form. In his opening statement, Nunes extended that rationalization: “We know there was not a physical wiretap of Trump Tower. However, it’s still possible that other surveillance activities were used against President Trump and his associates.” Nunes and his Republican colleagues used the hearing to amplify that suspicion. From an evidentiary standpoint, the hearing was useless. Comey and Rogers aimed to reveal nothing beyond the investigation’s existence, and they succeeded. But the hearing taught us plenty about the House Intelligence Committee. It’s run by lawmakers who see themselves as Trump’s lawyers, not as fact finders. The only path to a credible Russia investigation is an independent commission.